Take a minute and relax. Visualize what the big day is going to be like. The twinge in your belly, signaling a time of great change is nigh. You’ve opened yourself up, completely, to the arrival of a special person. The veil is lifted, briefly, to reveal the great mystery of life. 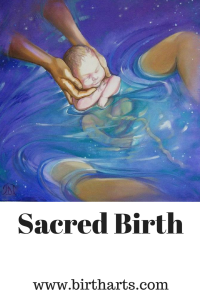 Birth is a sacred, mystical experience. But it’s hard to feel like a Goddess when bright lights are shining upon an antiseptic room, and you are distracted by a stream of staff to plug your beautiful body into machines that go beep, poke you with needles, and prod your sacred opening, as a clock looks down upon you with judgmental precision. It just doesn’t feel right. It is important to understand how hospital routine impacts your emotional, mental, physical, and spiritual state. A hospital can be compared to an assembly line. Medical procedures and tradition encourage efficiency in order to provide roughly the same quality of care to as many people as possible. This directly conflicts with the birth process, as unique to each woman as a snowflake. This is not just some emotional mumbo jumbo- the level of satisfaction with your birth experience will impact how well you bond with your baby. The strength of your bond will impact how well your child will attach to you, which has long-lasting effects on how your child will approach relationships and independence. Sure, you have plenty of time for you and baby to get to know each other. Bonding doesn’t stop when you check out of the hospital. It sure does help when memories of the birth aren’t clouded by a stressful birthing environment. Mom’s security and comfort will determine how much she will enjoy the experience- the more she enjoys it, the less pain and medical intervention she will need. It is wise to educate yourself on what to expect and ensure you have plenty of support. Researches on medical dehumanization and on sexual objectification have independently revealed similar characteristics of power imbalance, victimization, and control. Medical dehumanization and sexual objectification are a double whammy also known as intersectionality- when a person comprises two or more categories of disempowered groups. In this case, (non-minority, heterosexual, cis-gendered) woman and patient. There can be an assumption floating about the antiseptic halls of medicine that women in childbirth are defective and weak objects in need of improvement via masculine intervention. Seriously, would humanity be here if women weren’t fully capable of doing birthing babies? Pregnancy is not an illness in need of a cure! Your body is not a lemon!! Read the table below and see the similarities for yourself. Given the studies documenting the damaging impact sexual objectification has on women, it is disturbing to see hospital staff treating women in childbirth in a nearly identical manner simply as a matter of course. The behavior is excused on the grounds it will provide better diagnoses and keep staff calm in case of an emergency. However, this belief is questionable, particularly as it relates to childbirth, since this is a natural physiological process. The woman in question is not sick, after all. We don’t keep a doctor on hand every time we climb into the car, just in case we have an accident. So it seems absurd to include professional healers to our bedside during birth. The overall impact of objectification: your unique birth experience will be treated as though it is a mechanical process, identical to the women who birthed before, and any variation to the Ideal Birth as laid down in the holy medical textbooks is a problem needing to be fixed. This impacts the chances you will be treated with dignity and respect. It will interrupt the flow of your birth, slowing you down and causing unnecessary pain. Once a birth has deviated too far from your hospital’s rigid norm, it is easy (and profitable) to scare women into accepting “help” they don’t always truly need and tends to disrupt the birth process by telling the mother they are not in control and need experts to tell them what to do, rather than tune into their own intuition and rely on their inherent resources to complete their journey. Staff will try to make all the decisions, meaning your sense of self-respect and empowerment in this transformative experience will be reduced to feelings of dependency and self-doubt. Not the best way to start motherhood! Want to try a different approach that celebrates your power as a woman and mother? Have your baby at home! Usually, any problem requiring hospital attention will be detected with plenty of time to go to the hospital. You can start out at home and go from there. You will be the boss in a comfortable and safe space. This is how women gave birth for centuries. Only in the last 100 years have women moved into delivery rooms, and it took quite a lot of convincing from the medical establishment for them to do so. If you decide you must have your baby in a hospital, take time to enjoy the experience and make it your own. Wear a nightgown from home. Dim the lights. Dance! You need to feel secure and relaxed to accomplish the great work ahead of you. The best thing you can do, at home or in the hospital, is to hire a doula. She is a non-medical addition to your support team. Your doula will provide physical and emotional support. She provides spaciousness for you as you create space for your child. It is her job to empower you, help you relax and enjoy the flow of birth, and act as a buffer between you, your fears, and the hospital staff so your wishes are respected. Ina May’s Guide to Childbirth. Ina May Gaskin. 2003. Bantam. “The Origins of Attachment Theory: John Bowlby and Mary Ainsworth”. Bretherton I. Developmental Psychology 1992 vol. 28 no. 5 759. Johanna Schnell is a doula based in Rio de Janeiro, Brazil. She believes healthy parenting will save the world. Six is the New Four!